Previewed at: Palace Central, Sydney, on 6 February 2018. Richard Loncraine’s Finding Your Feet has been described as ‘a hilarious and heart-warming comedy’ and it is - in part. It has also been labelled as an ‘oldies’ delight’ and it is that too! It certainly has some very sweet moments and, like many films of this type (à la last year’s Hampstead), relies heavily on the performances of its cast of seniors, rather than the script, which is slightly cringe-worthy but still delivers - in part. The impressive company is led by the very busy Imelda Staunton (The National Theatre’s Who’s Afraid of Virginia Woolf? and Follies) and Celia Imrie, followed closely by Timothy Spall, David Hayman, John Sessions and Joanna Lumley, the old guard of Brit actors who will be the draw card for an audience ‘of a certain age’. Those viewers probably won’t be disappointed by this uplifting, but not terribly original, film. Bif (Celia Imrie) lives alone in a run-down council estate in London’s Camden Lock vicinity but hers is a fun, slightly Bohemian life full of friends and activity. She’s settled in her ways but happy in her skin until her estranged, stuck-up sister Sandra (Imelda Staunton) arrives on her doorstep, having fled her marital home after finding out that her husband Mike (John Sessions) has been having an affair. Sandra is suffering from a double whammy as she has not only had to abandon her lavish surroundings but also give up the title she acquired through being married to John, a decorated, top-ranking member of the Metropolitan Police. Bif tries to get the starch out of her petticoats, so to speak, and takes Sandra under her wing, carting her along to the local dance classes and introducing her to her friends, a curious lot who are more down-to-earth than the types Sandra usually hangs out with. Bif’s best gal-pal is Jackie (Joanna Lumley) an adventurous retiree who goes on Internet dating sites and reveals that she got more than she bargained for on a recent night out. Another member of Bif’s circle is helpful handyman Charlie (Timothy Spall), who lives on a houseboat next door to his close mate, Ted (David Hayman). As Sandra begins to settle into her new surroundings we learn that she was a terrific dancer in her youth and, little by little, she begins to drop her haughty exterior. It’s not all a bed of roses however, and things start to get complicated when one of the gang falls ill and the ensuing drama forces Sandra to do some real soul-searching. 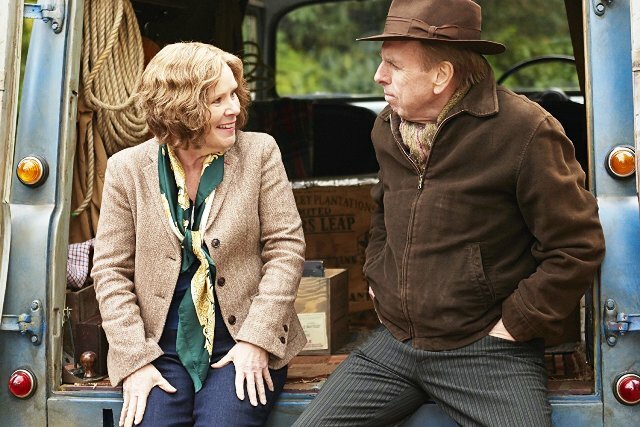 Finding Your Feet could have been a mawkish pile of drivel but is actually quite endearing as it brings to light a positive lesson, namely that, in life ‘sometimes you need a push in the right direction’. Staunton plays the troubled woman really well and seems to glow once she begins to develop her true nature. Her relationship with Bif is put to the test and yet the siblings find they have a lot of love and respect for each other when they begin to rekindle their relationship. The friendship between Charlie and Ted is also endearing and throws a positive light on men aging and the need to look out for each other, especially single men and women as they begin to wither. Visually this is a treat for both Anglophiles and Italophiles (spoiler alert! some of Finding Your Feet is set in Rome). It’s not high art but it is a fun way to be reminded that old age is inevitable and can be embraced, if you are lucky enough to reach it!